Get Carded at The Pet Beastro! We're in full holiday mode here at The Pet Beastro! As we prepare for the season of gratitude and thanks, we wanted to let you know about a new way we have for you to share us with your friends and family - gift cards! We're in full holiday mode here at The Pet Beastro! As we prepare for the season of gratitude and thanks, we wanted to let you know about a new way we have for you to share us with your friends and family. When you come in and shop starting this month, you'll see a new offering at our counter - gift cards! You can choose one of three styles - our standard green gift card, a Thank You gift card or a Congratulations gift card. For the holidays, we will also be adding a festive winter-themed gift card. If you have a friend who loves their pets but you don't know what to get them, this is the perfect gift. Or maybe you just want to share what you love about The Pet Beastro with someone new. Or what about that new pet parent? 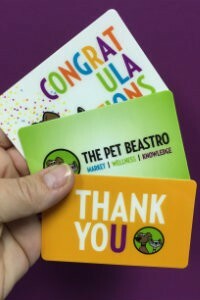 Available in any denomination, it's a fun way to share what we do here every day with pet fans! We have a lot in the works for this holiday season so stop in and start getting your wish list ready!